Why I deserve a medal: After about 5 hours of sleep Wednesday night, a long day at work yesterday, a large meeting I was very stressed out about, and a mandatory two-hour after-work meeting at a place I volunteer, I dragged home about 9pm, exhausted. But what did I do? I put on my running clothes and went to the gym. I was on the treadmill by 10pm. Because that's what you do when you're training for a marathon. Why I am actually the weakest link: I spent the entire run watching Jersey Shore, sending emails (you know you're not running fast enough if you can type), and bargaining with myself. The final deal I struck with me: stay on the treadmill for 4m and walk really really fast home and you can count the mile back-and-forth to the gym, calling it a 5m run. I'm on the fence about whether that's cheating or not. Why it's probably a draw: When I got home, I discovered not one but TWO small blood blisters, one on either foot on my second-smallest toes. The treadmill changes my gait. Yet another reason it's lousy. So I did the logical thing: I threw my dirty clothes on my roommate's chair and sat down on the couch with a beer. And a Gatorade, for balance. 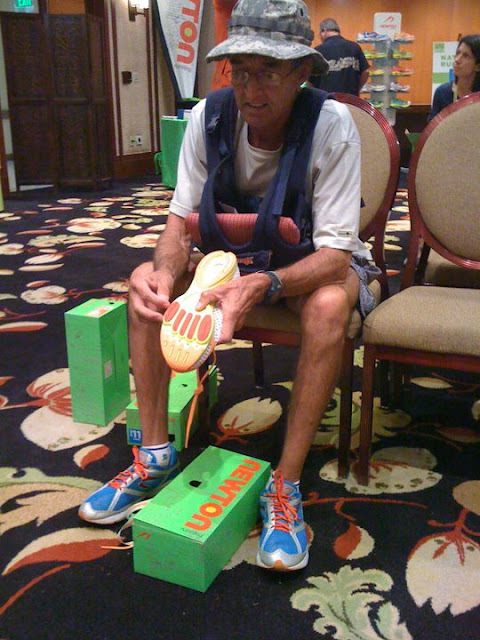 But, more importantly, can anyone explain to me what my hero Frank Shorter is wearing here? (I can tell you what he's NOT wearing - a wedding ring). Nothing says eligible stud more than a boonie hat, baby harness, and a brand-spankin-new pair of Newton MV2s. But where is the baby? And what's in the baby harness - because my fear is that (oh, man, I'm struggling with this) he's carrying something around in it, using it for storage like a backpack. First off, I'm so honoured to have indirectly contributed to your blog. I feel a little famous. Next, my eye simply can't leave that pinky peach thing that is in the baby harness. Is it an extra t-shirt? Is it a small cushion? Is it the protective cloth in which he totes his Olympic medals? Is that a baby harness? Seriously? I sure do hope there is a baby around there that should be in that thing. If there's not...I'm afraid he might use it for carrying around stuff...which is somewhat disturbing. Also, it seems like he's wearing some sort of short version of the original MC Hammer pants? Did they come with the baby harness? The Newton's even it out, though. In my humble opinion. These babies give him the instant cool factor (I'm a nerd, I know...). Beer and Gatorade at the same time? Brilliant! OMG I'm trying really hard to stifle my giggles right now so I don't wake up my husband and I have to even say "Jersey Shore" and "baby harness" to him. LOL! You have just made my day after a lousy saturday half marathon that wasn't. Beer and Gatorade? How did you tummy feel after that concoction?